When I was looking for a house to buy my friends were knee deep in renovating their entire house. I was taking a tour of their kitchen remodel and my friend showed me how, three months later, they still hadn't glued on the countertop backsplash. He told me, "This would take me an hour tops but it's these little things that never get done when you own a fixer." I swore I'd be different. And yet, here I am, two years after I patched that mystery hole in the ceiling of my kitchen and I still haven't textured that spot or repainted the kitchen ceiling. My hallway vestibules still haven't been painted, even though it would probably take an hour to complete. My kitchen window sits unpainted, with forty different test colors ringing it. There a small hole in the baseboard of the bedroom that needs to be filled. So this year I'm going to focus on the little things. I'm going to hang curtains. I'm going to look into toe boards (we have none in the house). I'm going to finally paint the kitchen door and the kitchen window and that spot above the door that never got painted for reasons I no longer remember. And we have a couple of big things coming down the pike: we're going to replace the front picture window that is rotting and get the house painted. And I'm going to start landscaping the front yard, including another rain garden. I'm really excited. Do you own a house? Then you probably have a stash of wood scraps like this in your garage or your basement. I have a mountain of end pieces left over from when I put in the fences. Before they were just a fire hazard but now they are destined to be poorly executed crafts! Have you seen this tutorial on Ready Made? You use gel medium to transfer a photo to a piece of wood. They are a little sparse on the details and you have to find the link to this video on YouTube that is buried in the comments. I found it a little tricky, so here's what worked for me. I did a couple of test runs using different photos, since I have a zillion pieces of wood in my garage. I went down to Kinko's because all the tutorials say that copies from an inkjet printer won't work; it has to be a laserjet image. I printed out copies of photos in both color and black and white onto standard printer paper. You'll want your surface to be smooth. I used my hand sander to smooth the wood down, starting with 120 grit and moving up to 320 grit, except that first I started with 220 because I wasn't caffeinated. I couldn't get the deeper ridges out, despite an eternity of sanding. So yeah, go get a cup of coffee and start with the low-grit, dumbass. 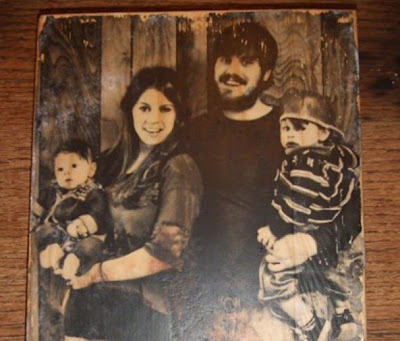 You could also do this with a sanding block. I didn't smooth the sides of all of the pieces because I'm an idiot. People don't like rough edges, so if you're giving these as a gift don't be so lazy. Then you just paint on a thin coat of gel transfer using your brush (I used my trusty Purdy). Then slap on the photos, and make sure there aren't any bubbles. I had some trouble with parts of images rubbing away and I initially thought that I hadn't painted on a thick enough layer of gel medium. Subsequent attempts were made with a thicker layer of gel medium, which looked terrible and didn't solve the problem. I think the key was curing time. The Ready Made tutorial tells you to let it cure overnight but other places on the Internet say to wait 48-72 hours, and this really helps, though you will lose parts of your image. So just square your thinking away right now that this will look rustic. Once it has cured you wet the paper on the wood block and start rubbing it away. Try to ignore how bad the grout on your kitchen counters looks. You'll think you've gotten it all, only to let the block dry and find out that there's still so much paper left. If you don't remove it all your finished product will look like this, as if your friends' baby has sprouted white hair from her face. Not so good. I thought I'd like black and white photos better but I definitely prefer using a color image. I used Instagram photos for that old-timey feel. You could swear that you got all the paper last time but nope, you need to do more peeling. Nope, you're not done. Keep peeling. You can see that I'm losing small parts of the image. RUSTIC. YOU HAVE GOT BE KIDDING ME. Can you see what happens when you put down too much gel transfer? So you're going to peeling a good long while. Toward the end I stopped soaking the entire image and instead put a drop of water on my finger and went after very small areas. This worked a lot better. I found that the longer I let the gel transfer cure, the easier the paper came up. Also? The harder the wood, the easier this part is. I had a scrap of 1 x 4 from Custom Cedar Products and the paper came up so much more easily than the pieces from Home Depot or Parr (whose boards are always flimsy in comparison). Then let it dry completely and slap on a coat of Mod Podge. Attach your hanger and call it good! Now if I could do it all over again I would have stained a border around the images. I think that would have elevated the look of the project. There's probably a thousand different things you could do, especially if you were an art major and actually know how this stuff works. I'm going to keep playing with this idea, since I have eleventy million more pieces of cedar in the garage. Use the hardest board scraps you can find. Start sanding with a low-grit sandpaper. Use a thin layer of gel transfer and let it cure for 48-72 hours. Be okay with the fact that it will take more than a few rounds to get the paper off, and you may lose bits of your image. This was graffiti we found in Italy that looked so much like us our friends thought we painted it. The boy's sister, who I will never stop pressuring to start a blog because she does stuff like this in her sleep, made us a chalkboard hanger for Christmas. I can't believe I showed a picture with a detail of how crappy the kitchen door looks. That's how much I love this. Watching squirrels try to break into the new bird feeder is endlessly entertaining. They try so hard. Let's get a little closer . . . I think I could reach if I just . . .
. . . streeeeeetttttttchhh . . . .
We're also getting birds at the feeder, which is really exciting. In other unexpected birding news, dumping uncomposted leaves all over these beds has resulted in the birds foraging here like CRAZY. I've never seen so many feeding in the yard before. They have zero interest in my native plants; it turns out they just want store-bought birdseed and the bugs hiding under non-native tree leaves. Go figure. I still can't identify any of them, either. Greg will ask, "What's that one?" and I'll reply, "A cute little brown one." Have you heard about this product that eliminates mold, mildew, and odors? It's called Room Shocker or roomSHOCKER, depending on what part of their website you're visiting. Something similar was apparently used in houses that were flooded during Hurricane Katrina to eliminate mold. I read about it some time ago on Apartment Therapy, bought some on Amazon, then forgot about it. I've been having really bad allergies ever since Greg moved in; I wake up in the morning, start sneezing, keep sneezing, and then sneeze some more. My friend Erin cheerfully informed me recently, "You probably have mold!" Then my parents came to visit and my father, whose super sense of smell I inherited, started sniffing around my basement. Does it always smell like mildew down here? Before Greg moved in, I always left the door to the basement shut. Ever since he moved in we leave it open. I don't know why we do that, but I'm thinking that maybe an allergen from down there is wafting into the rest of the house. So yeah, I gave Room Shocker a shot. It's pretty easy to use. You open up what looks like a frappucchio container, read the instructions that are by turns breezy, then terrifying. "Room Shocker is all natural and cannot hurt you. Fill the container with warm water to the line indicated on the cup. DO NOT FILL WATER BEYOND THIS LINE. DO NOT TOUCH THE PACKET. LEAVE THE ROOM IMMEDIATELY. 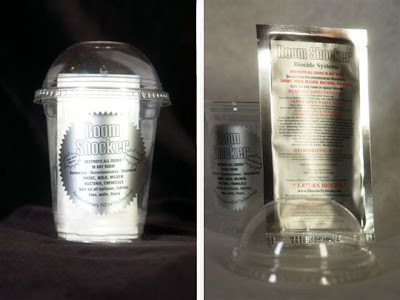 There's no need to leave the house, if you don't wish, as Room Shocker is completely harmless!" I filled my cup, ran out of the basement, then left for work. But first I started second-guessing that I pushed the packet down far enough, so I went back into the basement to find a cup full of noxious yellow liquid that made my eyes burn. Whew, I did it right. Seven hours later I returned home to find that you could smell the chlorine from outside the house. I can't imagine trying to stay inside the house all day. I decided to open some windows, leave again, and buy a bird feeder. I had a gift card from when I got my backyard habitat certification. The Backyard Bird Shop is so. much. fun. They're so excited that you're getting your first bird feeder! They're so knowledgeable! My salesperson was A-D-O-R-A-B-L-E. I love that stores like this thrive in Portland. So far my allergies aren't any better which means that it didn't work, or I don't have mold and I'm allergic to something else, or I'm allergic to Greg. So now is the time for all the worriers to come out of the woodwork and warn me that I have black mold and that I'm going to die. Or that chlorine causes cancer and I'm gonna die. Because I don't worry about that stuff enough as it is.